AURORA, Colo.—Baptist Collegiate Ministry (BCM) students from Rogers State University (RSU), Oklahoma City Community College (OCCC), Bacone College and Connors State College spent their spring break in Aurora, Colo., serving the Karen people. The group of 27 consisted of six BCM leaders and 21 students. RSU has been making trips to Colorado for four years. When they were there the first year they met a Karen girl by the name of Nau Naw, who interpreted for the group all week. They returned the next year, and Nau once again translated for the group. She asked the group if they knew of any summer work opportunities and was informed about Falls Creek Baptist Conference Center. She applied and has now served on Falls Creek’s summer staff the past two years. The Karen people are refugees from Burma, who left their homes due to persecution. They found solace, living in refugee camps. If they get approved to come to the United States, they arrive already in debt from their plane ticket. The first thing they have to do is find a job and a place to live. Then they begin to learn English and learn how to adapt to life in the United States. 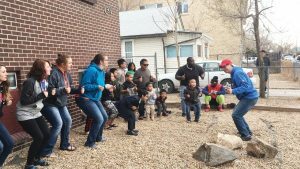 The BCM group arrived Sunday, March 12, at Aurora, Colo., First, their host church. They attended multiple refugee church services where they got the opportunity to worship with the refugees whom they would help throughout the week. Some students were able to go to a service and observe how the Karen worship. Other students were able to participate in the services by leading praise and worship and sharing their stories. Throughout the week in Aurora, the group helped with yard work, cleaning houses and laying a new floor. Members of the BCM groups had the opportunity to lead a Backyard Bible Club for two days in the late afternoon where they led the children in singing songs, playing games, making crafts and telling Bible stories. One of the most vital parts to the mission trip was helping the Karen people fill out necessary paperwork. The students helped them with applications for U.S. citizenship or necessary documents to obtain green cards. One evening, the group was able to attend a seminary class specifically designed to provide the refugees with Biblical training. There students learned what refugees go through to get to the refugee camps, what happened while they were in the refugee camps and the process of arriving in the United States. 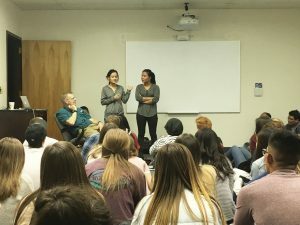 Personal stories from three of the refugees whom the students met throughout the week were shared, along with two of the Oklahoma students who shared their own stories.